"My roommate in college had a toaster oven and I used it quite a bit. 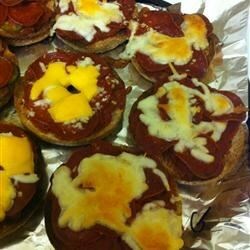 These bagel pizzas are foolproof and taste great." Spread bottom bagel half with tomato sauce; add cheese, onion, bell pepper and pepperoni. Place other half of bagel on top. Preheat toaster oven to 425 degrees F (220 degrees C). Place bagel in preheated toaster oven and toast about 10 minutes, or until bagel is golden brown. These are great. I adjust to the taste of each diner, but they are much loved at our house and have been since I was a child. I have made with bagels, but actually prefer English muffins. these are simply delicious. Usually i just use regular wheat bread instead of bagels or english muffins. Still its great!